Dinner at Christina's: Local Harvest & misc. I just wanted to take a moment to spread the word about Local Harvest. This is a national website devoted to providing you with the best of organic food options, and close to you. You can shop on the main page for everything from bee products, to meats, to special wools and fibers. The importance of organic and sustainable farming is not only healthy for you, but for the environment as well. These are hand-picked farmers that are responsibly growing and providing food to people. Getting things local is just the cherry on top! Local food means that less money (and gas) is spent shipping food from God knows where. Additionally, some products, like honey, are especially important to buy locally. Honey is made from pollen, so when you buy your local honey, you are exposing yourself to your local pollens and allergies - which is scientifically proven to help seasonal allergy sufferers. The meats are all grain-fed and fresh, so you can be assured they aren't pumped full of hormones, or highly processed like some options at the grocery store. If you check out the Community Supported Agriculture (CSA) section, you can buy directly from a farmer in your own backyard! Search by zip code for a list of farmers in your area. Then, you can see what they offer, and if it is a buy-in or exchange for work on the farm program. Pick-ups are usually weekly, and will be an assorted box of in-season fruits and vegetables. Each farm is different, so shop around to find one that offers what you like! You can even find some options to include farm fresh eggs in your weekly basket. And, while we're on the subject of healthy foods - I also want to share this new website with you. It's a collaborative effort between California pistachio growers and the FDA so that consumers have a trustworthy source to know which products are safe, and unaffected by the recent pistachio recall. All the companies and products named on the website are not affected by the recall, so you can continue to purchase and enjoy them. I really think it's a shame that responsible companies suffer right alongside the irresponsible ones when we are faced with a food recall. From French Fries to Flax Seeds is hosting this week's BSI contest - so check out her blog to see which ingredient she decides! Mariposa at What Do I Eat Now? is having a fantastic give-away I almost don't want to tell you about! Head on over, but please don't beat me!!! Johnny and I had a fun day yesterday, hanging out with his brother Mark and sister-in-law Kelly, up in Evanston! 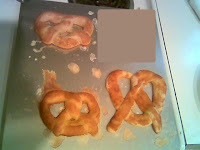 First, we made pretzels from scratch, using an Aunt Annie's knoc k-off recipe Kelly found in the new Food Network magazine. Unfortunately, I forgot my camera, so these were taken with Johnny's camera phone. They were really, really authentic looking and smelling, plus they tasted like the real deal (recipe to be posted in the future)! 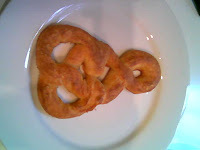 I censored an R rated one Mark made for giggles, and the cool braided one is Johnny's "pretzel of the future." Then, we went bowling, and headed back to their house for dinner, which I brought. The four of us devoured 101 Cookbooks' Rustic Cabbage Soup that I featured on my blog in September, and again last week as a guest post on Maggie's blog. We finished up the night by grabbing slices of pie from Baker's Square and watching a movie. Then, it was time to head home in a near blizzard! Boooo to snow in April!